A Very Marx Adventure | My adventures in learning about Marx, Marxism, and history. 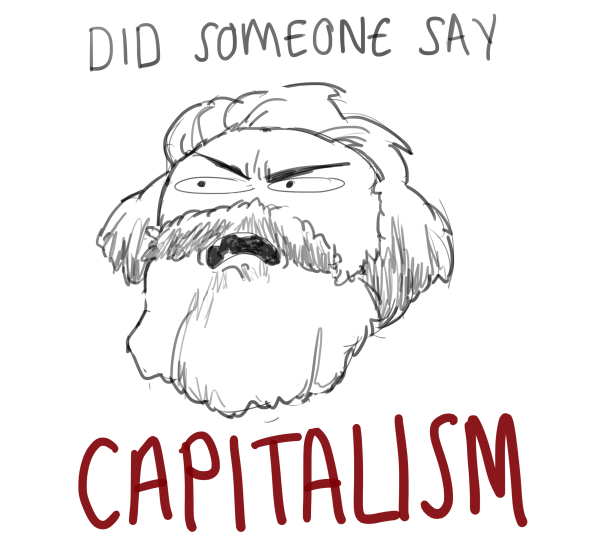 My adventures in learning about Marx, Marxism, and history. Brexit continues to cause chaos in the British parliamentary system. As I write this, Theresa May has lost her second ‘meaningful’ vote on the deal negotiated with the European Union, and the debate over Brexit is almost the only thing the government and wider political class are able to focus on. In a superb article, Aditya Chakrabortty writing in the Guardian connects this crisis of the political class to the policies of austerity implemented by coalition and Conservative governments since 2010. In endlessly arguing about how to manage Brexit, politicians are using up energy that would be more usefully employed in addressing the problems that persuaded people to vote for it in the first place. Even more ironically, the members new Independent Group, specifically set up as a home for those in both parties who deplore Brexit as a historic mistake, continue to express support for austerity and the economics that created the frustration that brought it about. Paul Mason has a similar analysis in the New Statesman, arguing that “the class dynamics that are emerging in most Western economies” are driving the breakdown of neoliberalism under the impact of the very policies that it’s advocates have implemented over the years. The damage being inflicted on the Conservative Party by the attempt to deliver Brexit is symptomatic of the wider disintegration of the economic consensus they have managed over many years as the “natural party of government”. The government’s focus however remains on finding a way to implement Brexit, rather than tackle what caused 17.4 million people to vote for radical change in the first place, even though most Conservative MPs voted remain and likely think leaving the EU to be a strategic error. Why then, does Brexit continue to consume all this political energy that could more usefully be channelled into addressing the actual problem? Marx addresses a similar point in “The German Ideology”, the early and probably most detailed working out of his materialistic approach to the analysis of history and society. Here Marx sets out the connection between the “relations of production” and the rest of society. Marx is often portrayed as suggesting this is a mechanically deterministic relationship. Where the economy leads, the rest of society will follow. In fact Marx’s argument is more complex than this, but for the purposes of this post it is enough to point out that there is a deep and strong interconnection between how the economy is structured and how politics works, what problems it is possible for politics to tackle. Along the way these ideas, philosophies, and laws which form the basis of civil society become separated in thought from the economic relations on which they were constructed. Simplistically then, the ruling class get caught up in their own set of beliefs, their own philosophical view of how the world works. It is simply the natural order of things. And so, as Mason and Chakrabortty write, they are blinded by this to the impact of their own policy choices and to the changes in political economy they are contributing to. Brexit becomes a problem in its own right, something to be tackled in isolation, rather than inherently connected to wider society. It is no accident that the totemic policy for The Independent Group, driving the decision that it could no longer tolerate Jeremy Corbyn’s leadership of the Labour Party, is opposition to Brexit under all circumstances. They give priority to the halting of Brexit ahead of any other policy – including prioritising halting Brexit over delivering a progressive Labour government. Their world view is that of the ruling class, and in that world view the problems impacting those areas likely to vote leave (wage stagnation, the degradation of public services etc.) either don’t exist or if they do they are ‘natural’ phenomena not appropriate for policy interventions. Instead they seek to preserve the system as it is, without seeing how that system has failed to deliver for large chunks of the population. This entry was posted in Politics and tagged Marx, Politics on March 17, 2019 by 4harrisons. How and when to form new political parties seems to be very much in the news at the moment. The relationship between the Party and the wider movement has preoccupied Marxist thinking for quite some time too, ranging from the Bolshevik “vanguard” party of committed revolutionaries to the mass membership parties of the Second International. Underpinning which form of party organisation is considered to be effective are theories of revolutionary class consciousness. The Leninist conception of a vanguard party implies that left to itself a mass membership party will never become radical enough to spontaneously overthrow the status quo in a violent revolution. The solution for Lenin was to create a party at a distance from the working class itself, which could therefore develop a consciousness and commitment to the revolution and provide a lead to the wider working class from “outside” as it were. The vanguard party would be more radical than the working class and when the time came it would provide a lead. It is this assumption that the party knows better than the workers themselves that forms one basis for the criticism levelled at Lukacs by Kolakowski among others. Lukacs writes about the class consciousness that can be “imputed” to the working class, the consciousness that the workers “ought” to have based on the Marxist analysis of economy and society. To Kolakowski this is an intellectual justification for the repressive Stalinist dictatorship, justifying his chapter title that Lukacs represents “reason in the service of dogma” (Kolakowski 2008 p. 989). Once we accept that the party has access to a a more advanced understanding of the world than the mass of people, then the door is open to repression by a controlling bureaucratic elite. In the last section of History and Class Consciousness Lukacs tackles in some detail the issue of the relationship of both the party and the Marxist analysis of class consciousness to the wider workers movement. The theory he elaborates is more complex than the simple characterisation above suggests. Lukacs suggests that the relationship between the people and the party should be seen as a dialectic interaction. The party’s development of a Marxist analysis allows it to understand the direction of society but that analysis must always remain connected to the working class as a whole. By inference if the party ceases to maintain this connection, then it is no longer pursuing a Marxist path. There is a division between the party and the proletariat but the two are and must stay organically connected. Lukacs writes that the class consciousness of the working class is not monolithic, instead ranging across a spectrum based on individual variations in the position within the relations of production (a steelworker in a factory is the not exactly the same as a shop worker, even though they share membership of the working class). What’s more capitalism itself (and specifically reification within capitalism) creates a barrier to the working class becoming self conscious. The existence of a party one step removed from the spontaneous organisations of the working class remains important. Not because it needs to bring leadership to the working class in the way Lenin envisaged, but because it acts at the leading edge of the proletariat, working with the most revolutionary elements and always seeking to advance the thinking of the remainder. Lukacs is absolutely clear that he does not accept the subsequent Stalinist assumption that the Communist Party can itself be a replacement for the working class. So where does the “Independent Group” fit in? Lukacs theorises a party that is organically connected to a class, working at its most radical leading edge while seeking to bring the rest of the class along with it. The Independent Group more closely resembles the party wholly disconnected from a base in society and instead assuming that it knows itself what is best for the people. It seems indeed to assume that it can “function as a stand-in” for the working class while seeking to co-opt them to a fundamentally middle class political agenda (although in truth we don’t as yet really know what they stand for). My short review of History and Class Consciousness is here, and some thoughts along similar lines based on Fredric Jameson’s rehabilitation of Lukacs in “Valences of the Dialectic” are here. This entry was posted in Marxism and tagged IndependentGroup, Lukacs, Marxism on March 7, 2019 by 4harrisons. History and Class Consciousness is a well known text from Lukacs’ early career although as his later preface makes clear he subsequently disowned much of it. It remains however hugely significant for re-emphasising the Hegelian and dialectical side of Marx’s work. I re-read this after reading Jameson’s “Valences of the Dialectic” and Andrew Feenburg’s “The Philosophy of Praxis” both of which cover Lukacs’ thought in some detail and are well worth reading as preparation. In structure History and Class Consciousness is a collection of essays mostly written in the early 1920s. It is important to bear in mind – because it colours Lukacs’ writing – that at this time the survival and direction of the Russian Bolshevik revolution was still doubtful and Stalin was in the future. There is much that is interesting, and once you are roughly familiar with the basic concepts of Hegelian dialectics then it isn’t that difficult a read (both Feenburg and Jameson cover this, and if you can survive any Zizek book then this isn’t a challenge). Lukacs discusses a number of key concepts: reification drives Lukacs understanding of how capitalism structures knowledge. It is an extension of Marx’s theory of the commodity where relations between things come to take the place of relations between people in the capitalist economy. Lukacs extends this to the whole of society, describing how all knowledge becomes broken up and commodified. The truth can only be approached through understanding society in its totality which structures knowledge within that society. Knowledge in other words is socially determined. The science of capitalism is conditioned by economic and social structures of capitalism itself. It drives what we seek to understand, and how we understand it. These two factors then both drive the class consciousness of the proletariat, and the role of the Communist Party in helping the workers to break free from reified thought processes. This concept in particular has given Lukacs a bad press for the idea that there is an ‘imputed’ class consciousness which is different from the actual consciousness of real workers. Jameson coupled with a close reading of particularly the last essay here (“Towards a Methodology of the Problem of Organisation”) make it clear that things are much more complicated than this and deserve a much closer reading. Kolakowski’s magisterial work on Marx and Marxism dismisses Lukacs as having put his intellect in the service of the later Stalinist party. Feenburg and Jameson both go a long way towards rehabilitating his thought. Lukacs is worth a deeper analysis than Kolakowski allows for. He brings out the Hegelian side of Marxist theory, and thereby opens up aspects of Marx’s thinking that have often been obscured, particularly by the ‘vulgar’ Marxists of later periods. My thoughts on Jameson and Lukacs can be found here, and my review of Andrew Feenburg’s book “The Philosophy of Praxis” is here. Some thoughts on class consciousness and the new Independent Group in the UK is here. This entry was posted in Reviews and tagged Lukacs, Marxism, Review on February 25, 2019 by 4harrisons. In this book, Feenburg connects Marx’s writing on alienation from his early “Economic and Philosophical Manuscripts” to the early work of Lukacs on totality and reification and then through to the work of the Frankfurt school, and in particular Marcuse. The thread that Feenburg draws out is that of a common “Philosophy of Praxis” – hence the title of the book. This is founded on the connection between practical activity in the world (“praxis”) and how we think, understand, and analyse that world. He draws on Marx’s early work to describe this not as philosophy but as theory or “metacritique”, seeking the emphasise the break between classical German philosophy and the thinking of Marx and subsequent thinkers. The difference is that this metacritique does not take as its starting point the division between thought and reality used for example by Kant. Instead both the early Marx and the early Lukacs see a unity between the two, something Lukacs used the word “totality” to describe. This means that the basis for our understanding of the world is at its core socially determined. Under capitalism the very structure of knowledge is based on individualism, market forces, and the separation of ownership of the means of production from living labour. It is this separation of people from each and particularly from the outcome of their labour that the early Marx describes as ‘alienation’. In Lukacs early work (in particular History and Class Consciousness) he develops this further in the theory of ‘reification’. Social relations between people under capitalism become static relations between things, leading to the assumption that social constructs (such as the ‘laws’ by which the economy operate) become fixed and immutable. In fact this things are socially determined during the course of history, and our understanding of the world about us is inseparable from the history of society (a point not dissimilar from one made regularly by Zizek about historical subjects positing their own presuppositions). This raises a challenge for Lukacs’ view of science, and in particular natural science, as it implies that much of what we ‘know’ is in fact determined by how capitalism structures society. But if that is the case, how are we to restructure knowledge without returning to the absurdities of a Stalinist “science” driven by the political needs of a ruling party? Feenburg does a good job of working through the intricacies of these theories and narrating its development from Marx to Lukacs to Marcuse. The end result is that he largely rehabilitates Lukacs in particular from the condemnation of writers such as Leszek Kolakowski whilst not shying away from the challenges and difficulties. A useful book to read for anyone with an interest in the Hegelian strand of Marxism. See also my post on Jameson’s rehabilitation of Lukacs in “Valences of the Dialectic“. This entry was posted in Reviews and tagged Critical Theory, Lukacs, Marxism, Review on February 3, 2019 by 4harrisons. In his monumental work “Main Currents of Marxism” Leszek Kolakowski is highly critical of Lukacs, titling his chapter on him “Reason in the Service of Dogma”. Kolakowski claims that Lukacs showed how Marx’s philosophy “could be used to justify the self-glorification of Communist bureaucracies” (Kolakowski 2008, p. 1031). Simply put, Kolakowski holds that Lukacs is interesting for the way he brings forward the Hegelian background to Marx’s thought, in particular with his thinking on reification and totality. However by treating the Communist Party, as the sole arbiter of what the working class ‘ought’ to believe, with those who refuse to believe labelled as subject to false or “imputed” consciousness, Lukacs lends philosophical credence to the Stalinist dictatorship. In “Valences of the Dialectic” Fredric Jameson seeks a rehabilitation of Lukacs. Jameson acknowledges that Lukacs argues for the priority of the category of social class over other analytical categories, for example in modern politics the categories of ‘identify politics’ such as gender and race. For Lukacs social class is the driver of history, and the working class have a particular role under capitalism as a progressive force. This indeed implies (as highlighted by Kolakowski) that the working class ‘ought’ to be revolutionary, and that if they aren’t we are left struggling to understand why not. What then can Lukacs mean in his analysis of working class consciousness and the role of the party? Jameson takes a different approach, drawing a connection to “feminist standpoint theory“, a subsequent theory which builds on Lukacs, Hegel, and Marx. The social location of an agent “plays a role in forming what we know and limiting what we are able to know” (Bowell). The social relations that underpin capitalism condition how people in different classes understand reality, and open up the possibility of revolutionary consciousness. Reification – the turning of social relations between people into ‘objective’ relations between things – is then the key barrier which stands in the way of this revolutionary consciousness being realised. It imposes patterns of thought founded in the commodity relation onto knowledge, and the goal of theory is to allow us to see through the reified structures to the reality underneath. Jameson relates this to the work of Thomas S Kuhn who in “The Structure of Scientific Revolutions” describes the mechanisms of scientific progress in very similar terms. The practice of individual scientists operates within a socially conditioned epistemological framework which is only broken in traumatic ruptures following an accumulation of anomalies which the old framework can no longer account for. When this happens the outcome is a ‘paradigm shift’ that dramatically changes how we see the world. Jameson’s short chapter on Lukacs makes sense of his writing on class consciousness and fits it into a wider framework of socially conditioned knowledge which extends beyond the Marxist tradition. Kolakowski’s criticism retains it’s insight in light of the Soviet experience, and Lukacs well known subsequent self criticism and support for Stalinism supports this. But for me he remains a thinker worth engaging with. This entry was posted in Marxism and tagged Marxism, Philosophy on January 26, 2019 by 4harrisons. The law of the negation of the negation. The remainder of the book is then a range of essays, often previously published elsewhere, which implement and expand on the use of dialectics across a range of philosophical and revolutionary areas of interest. Throughout Jameson is keen to emphasise the analytical side of Marx, and to avoid the retrofitting of philosophical ‘systems’ (structuralism, existentialism etc.) onto his thought. In this sense Jameson takes the same stance as David Harvey who in his work on Capital encourages us to read it on Marx’s own terms. Much of this fascinating and extremely thought provoking. It is not however a basic introduction to dialectics, and you are I think best served coming to this book with at least something of an idea of what it is all about. Some – particularly the final two chapters based on literary criticism – is quite dense reading. There is an extended discussion of spectrality based on the work of Derrida which is masterful, and quite an achievement to have unpicked from Derrida’s impenetrable work. Jameson also discussed Lukacs in some depth, and does a good job of rehabilitating his concepts of reification and totality as key themes. He also provides a convincing exposition of ‘false consciousness’ which belies the standard use by the worst of vulgar Marxism. The final analysis of time, narrative, and history is hard work but worthwhile for understanding the complexity involved in time as a category. This book then is a description of the dialectical method, but more than that it is the detailed and expert use of that method in a range of insightful analyses. More than anything it is inspiring for the continued value and use of dialectics in thinking about the modern world. I wrote more detailed notes while reading this, along with blog posts on spectrality, dialectical materialism, totality and pluralism, sublation, and Lukacs inspired by various sections. This entry was posted in Reviews and tagged Dialectics, Marxism, Review on January 6, 2019 by 4harrisons. These are some jotted notes from my reading of Fredric Jameson’s “Valences of the Dialectic” – a fairly hefty book (both in size and density) published by Verso in 2009. “The dialectic” is the philosophy developed by the followers of Marx, the marx-ism created by his inheritors (including Engels) that Marx may or may not have subscribed to. “Many dialectics” is more broadly the use of dialectical categories and processes by a range of thinkers, and includes a useful development of the “base/superstructure” dialectic as historically contingent – that is needing to be understood on each occasion in its specific historic context rather than as an overarching law which is always the same in all situations. “It’s dialectical!” is the need to express or explain dialectics themselves in a dialetical way, and how this can erupt in different areas of thought. But with a call to truly think through the complex implications each law brings, and in particular to avoid viewing things as separate but connected or proceeding through a neat sequence of thesis-antithesis-synthesis triplets. Instead it is a frame through which we can avoid thinking simplistically and try to see the complexity of cause and effect, change and progress. In the second part Jameson discusses Hegel directly, and in particular the relationship between ‘common sense’ knowledge (‘Verstand’) and more properly dialectical knowledge or ‘Vernunft’. The theme is that Verstand is a reifying vision of the world overcome by Vernunft. The third part walks through a number of modern critiques of dialectics. First is a fascinating section based on Jacques Derrida’s “Spectres of Marx“. I am no fan of Derrida. But Jameson’s exposition is inspired, built around the idea of “spectrality” and it’s importance to dialectics generally and Marx specifically. What this means to Jameson is that any given moment in history, in time, is not fixed or given in isolation. The spectres of the past leak into it, are visible in it. Similarly the ghosts of possible futures can also be seen. Each point in time is then like a long exposure photograph capturing the movement from what was, to what is, to what will be. This is completely consistent with how Bertell Ollman describes Marx’s view in “Dance of the Dialectic” as studying history “backwards”. I didn’t get so much from the section on Deleuze, so I’ll skip over that. The next section on Lukacs is much more interesting, and I’ve written separate posts on Jameson’s use of the concept of totality to explain pluralism and the co-option of dissent in modern capitalism, and his rehabilitation of the influence of Lukacs’ thinking on class and class consciousness using ‘standpoint’ theory and the example of modern feminism. In general it seems to me that Jameson is sympathetic to Lukacs’ Hegelian Marxism, despite in general arguing against the retro-fitting of philosophical systems onto Marx’s thought. There is then a long section on Sartre which contains some interesting material in particular on how groups come to coalesce under the influence of the ‘other’ or thirds and subsequently ossify into what Sartre describes as ‘practico-inert’. Also a useful description of praxis. In general though I found this section to be quite dense, probably coloured by the fact that I don’t have much background in Sartre. The remainder is a varied collection of essays bringing a dialectical analysis to subjects such as cultural revolution, Lenin, and ideological analysis. Throughout, Jameson is keen to assert that Marx did not create a philosophy, although there have been a number of attempts subsequently to bolt one onto it – including structuralism, existentialism, and a variation on Hegelian thought. Jameson rather describes Marx’s thought as demonstrating a ‘unity of theory and practice’ and compares it to psychoanalysis. A chapter on Lenin discusses dialectics as part of a revolutionary process, when society reaches the situation where “one cannot change anything without changing everything” (Jameson 2009, p.299). This is a thought that seems very relevant to today’s ossified society where the change that is visible in the economy and wider society seem stuck within a carapace of politics (both of left and right) which is stuck trying to resolve the problems of the previous era. Finally as a derived from the priorities of ‘daily life’ displacing economic conflict (something I read as being a description of ‘identity politics’). It is clear however that any ideology however derived cannot think beyond the confines of the social limits of it’s own period. The opening chapter covers the fall of “actually existing Marxism” and makes a number of fascinating points. Jameson discusses in depth the defeat of the Soviet Union and the changes wrought in capitalism at the same time. It is a fascinating essay which makes a number of points relevant to the modern world. Jameson challenges the idea that social democracy is sustainable within a capitalist economy. For example on the welfare state its contradictions are “those of capitalism itself”. This strikes me as prescient for both Brexit and Trump (and the range of other rightist populist movements). His key point is that Marxism was a product of the capitalism of its day, and therefore that “a postmodern capitalism necessarily calls a postmodern Marxism into existence over against itself” (Jameson 2009, p.409). The final chapter in this section are two extensive essays on globalisation as both philosophy and politics. The final part is an extended discussion of narrative, time, and history. I found this hard to follow in places drawing as it does on Jameson’s background in literary analysis, and using as its basis the Poetics of Aristotle and their use in analysis by Paul Ricoeur in “Time and Narrative”. This is another theme that runs throughout the book. In a dialectical process, capitalism in all it’s changing incarnations brings its own opposition into being. The opposition will condition what we are able to think of as possible in the future. This entry was posted in Philosophy and tagged Dialectics, Philosophy on January 6, 2019 by 4harrisons.